Is there any animal that is cooler than the liger? 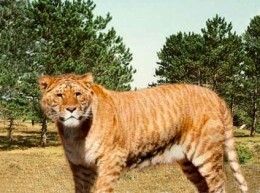 A cross between a Lion and a Tiger that is also the biggest cat in the world? Gotta be one of the most awesomest but I'm beginning to think a bearcat might be even more awesome. apparently there is also a donkra (donkey and zebra) Google it, they are pretty cool looking too. That's a tough one since the liger is undeniably cool. Though, in Hawaii at the Sea Life Park in Oahu they have a wolphin. Apparently, this little creature was spawned when a killer whale mated with a dolphin in captivity.